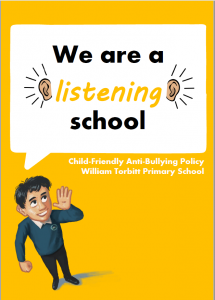 Have you read our new Child-Friendly Anti-Bullying Policy? Click here to find out how we stand against bullying in our school. Don’t ever think you’re alone. Tell your teacher if someone if someone is making you feel sad. your teacher or any other adult in school. Are you worried? Don’t be afraid to talk to us. If you are worried about something, don’t keep it inside. Tell an adult that you know and trust. As you begin to talk about it, you will feel so much better and the adult can help you feel less worried. If you want to look at the anti-bullying powerpoint we used in assembly, you can click here. Don’t forget the song we have learned called ‘Bag of Worries’. Click here to listen to it. With my bag of worries, do you understand? I don’t know what to do, my back is going to break. They even came with me when I went to the loo. Hey bruv, can you do anything, about my bag of worries, if you know what I mean? I’m trying to watch the telly, will you just cut it out! Hey friend, can you do anything, about my bag of worries, if you know what I mean? c’mon cheer up, don’t worry, be happy! Hey dad, can you do anything, about my bag of worries, if you know what I mean? Hey teach, can you do anything, about my bag of worries, if you know what I mean? “What’s with the bag?”, I thought I heard her say. We’ll have a cup of tea, and a right good blether.